The wait for details about Nvidia’s GeForce Titan X is finally over. The world’s “most advanced” GPU will feature a massive increase in CUDA cores, 12GB of RAM, and an unsurprising price of $1,000, the company said Tuesday, during a kick-off keynote for its GPU Technology Conference. 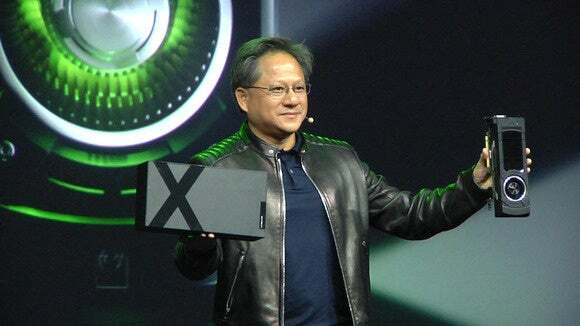 Nvidia CEO Jen-Hsun Huang said the company’s newest card would pack 3,072 CUDA cores, which is a third more than its previous top-end gaming GPU, the GeForce GTX 980. Huang also pegged the single-precision floating point performance at 7 TFLOPS, which is a significant increase over the GeForce GTX Titan Black’s 5.1 TFLOPS. Huang, however, also said the card would hit roughly 200 GFLOPs in double-precision floating point performance. That puts it on par with the company’s discontinued—and two generations old GeForce GTX 780 Ti—in double-precision performance. That’s a break from previous Titans, which have all ruled the roost in double-precision performance. The original GeForce Titan, for example, could hit 1,500 GFLOPS. "It is a gaming card," says analyst Jon Peddie of Jon Peddie Research. "Floating point performance is limited." Huang seemed unconcerned with the double precision performance, however, and showed off numbers that the Titan X could perform. Used for neural net analysis, Huang said a 16-core Intel Xeon would take 43 days to process the data. The original GeForce Titan would take six days and its replacement, last year’s GeForce Titan Black, would take five days. The new Titan X can do the same task in about 1.5 days, Huang said. No further details about the card were released, including gaming performance. Check back throughout the afternoon for more information.